The Story of Founding Apple Computer, Inc.
A Silicon Valley icon and philanthropist for more than thirty years, Steve Wozniak has helped shape the computing industry with his design of Apple’s first line of products the Apple I and II and influenced the popular Macintosh. In 1976, Wozniak and Steve Jobs founded Apple Computer Inc. with Wozniak’s Apple I personal computer. The following year, he introduced his Apple II personal computer, featuring a central processing unit, a keyboard, color graphics, and a floppy disk drive. The Apple II was integral in launching the personal computer industry. In 1981, he went back to UC Berkeley and finished his degree in electrical engineering/computer science. For his achievements at Apple Computer, Wozniak was awarded the National Medal of Technology by the President of the United States in 1985, the highest honor bestowed on America’s leading innovators. In 2006, Wozniak published his autobiography, iWoz: From Computer Geek to Cult Icon: How I Invented the Personal Computer, Co-Founded Apple, and Had Fun Doing It. It was co-authored by writer Gina Smith. In 2007, Wozniak joined Scottevest as an Advisory Board Member. 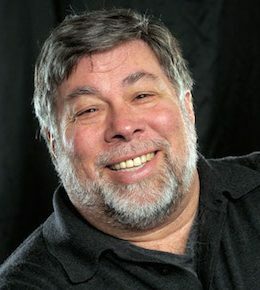 In 2009, Wozniak joined Fusion-io, a data storage and server company, in Salt Lake City, Utah as their chief scientist. In 2014 Wozniak became an Adjunct Professor in the Faculty of Engineering & Information Technology at the University of Technology, Sydney, Australia.